Sometimes salads go beyond a delicious tangle of greens and dressing and become a transcendent eating experience. 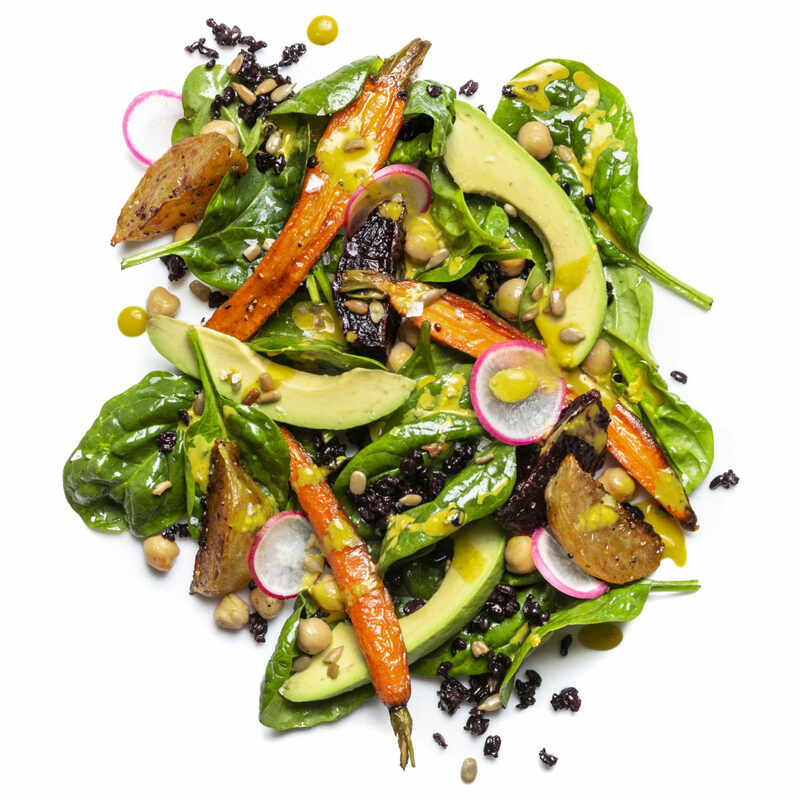 This salad by or editor Eric Lundy is one of those rare opportunities. Never mind that it’s so wholesome, you feel better about yourself just eating it. It’s the riotous color, diversity of textures, and vibrant flavors that make this a salad our team has repeatedly craved since first sinking our teeth into it. The anchor to its brilliance is a tangy-creamy-savory and vibrant yellow tahini and turmeric dressing. Caramelized, earthy root vegetables, garbanzo beans, and leftover rice add lip-smacking substance. Avocado chunks lend creamy intermissions, and toasted nuts and radish add toothsome pleasure. But here’s where it becomes even more fun: you can compose this salad of pretty much any combo of greens, roasted vegetables, seeds, and other kitchen remnants you have around. Make extra salad dressing and keep it in the refrigerator for up to 3 days; you’re gong to want it. Preheat the oven to 400°F. In a small ovenproof casserole or roasting pan place the beets with 2 teaspoons of the olive oil, 1/4 teaspoon of the salt and 1/8 teaspoon of the pepper. Toss to coat well and push to 1 side of the pan in one layer. On another part of the roasting pan, toss the carrots with 2 teaspoon of the olive oil, 1/4 teaspoon of the salt and 1/8 teaspoon of the pepper. Transfer to the oven and roast, stirring occasionally, until the beets are crisp-tender, about 45 minutes. The carrots may be done earlier, so check occasionally (they’re done when a fork can easily be inserted into the center). Let the vegetables cool to room temperature. While the vegetables roast, make the dressing. In a mixing bowl combine the remaining olive oil, tahini, lemon juice, garlic, turmeric and maple syrup in a small bowl. Add 1 tablespoon water and whisk until smooth. Adjust with up to another tablespoon water to pourable dressing consistency. Season with ½ teaspoon salt and ¼ teaspoon pepper. Set aside. To serve: In a large serving bowl, toss the spinach, rice, and beans with a bit of the dressing to lightly coat, drizzling a little extra olive oil, if desired. Season with a little salt. Scatter the roasted vegetables, avocado, and radish slices on top. Drizzle with the remaining dressing, garnish with the sunflower seeds, and serve.